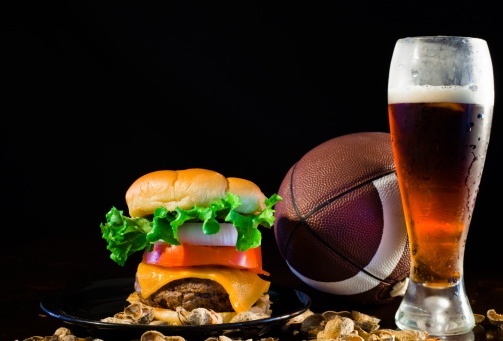 There’s nothing more American than football, beer, and pizza or wings. The standard Sunday fare has been an institution for years but now thanks to the craft beer trend, it’s getting an upgrade. While I always agree an ice cold Miller Lite, the Vikes, and a pile of buffalo wings is always a winning combination, I have some craft beer pairings for your football foods this season. Pairing beer and food so that both enhance each other requires attention to the dominant taste and flavor in each. When you consider offering a beer pairing with your menu items, identify the characteristics of craft beer like taste elements, flavors, intensity, and sensations of the craft beer you plan to feature. Taste elements are not created by mixing unlike flavor elements that come from combinations of taste elements. Huh? If you’re confused, don’t be. Think of beer flavors in a more simplified way – the three C’s. Complement, contrast, and cut. Complement means you’re looking for similar aromas and flavors in both the beer and food. They’ll bring out the best in each other. Contrast refers to dissimilar pairings that accentuate the differences of flavors. Cut is much like contrast but taken to the extreme; I’m talking about big, bold flavors or sensations that are taken down a notch with a beer that will balance the richness of the dish. Let’s talk football-food. Here are some options covering all bases of the day with appetizers, main courses, and even dessert. It’s true that beer goes with everything! Nachos – crunchy, salty, savory, meaty, and cheesy. Overall, not too heavy as nachos are considered finger foods. I’d pair the platter with a Fat Tire Amber Ale from New Belgium. Fat Tire has biscuit-like malt flavor with hoppy freshness. Buffalo wings – Boneless or bone-in and completely customizable with sauces and rubs, buffalo wings are one versatile football snack! And, because they can really pack the heat, I’d suggest serving wings with an American Pale Ale from Sierra Nevada. The citrus and pine hop character is lighter than that of its IPA counterpart, making it the perfect beer to sip while eating spicy wings. Chili – one of fall’s classic comfort foods. Chili is filling, warm, and homey. I enjoy a big bowl with a Sam Adams Boston Lager. The rich and robust full-bodied brew closely complements the heartiness the chili offers. Mushroom and Swiss burger – if you hit the grill or line at halftime, add a pile of sautéed mushrooms and slices of Swiss to those burgers so you can enjoy a Third Street Lost Trout brown ale alongside it. The earthiness of the beer will mix well with the flavors of the mushrooms. Hot fudge brownie – anything dripping with chocolate is going to be a bestseller on any menu, any time of day. Don’t overlook dessert as another opportunity to pair craft beer. Summit’s Great Northern Porter is like dessert in a bottle, with roasted malts offering up coffee notes and a sweet, chocolately finish. It’s like an updated version of dessert and coffee. At Bernick’s, we take time to fully appreciate what an honor it is to offer something to everyone. From soda to vending and micro markets, we take every aspect of our business seriously. Craft beer is no different. We’re constantly on the lookout for ways to bring even more innovation and growth to this giant segment so many of our customers are also passionate about. Offering you some ideas for craft beer and food pairings positions you as an expert in craft beer. Your patrons will value your insight and expertise, variations, and you’ll keep them loyal to and engaged with your brand. Everybody wins with craft beer!